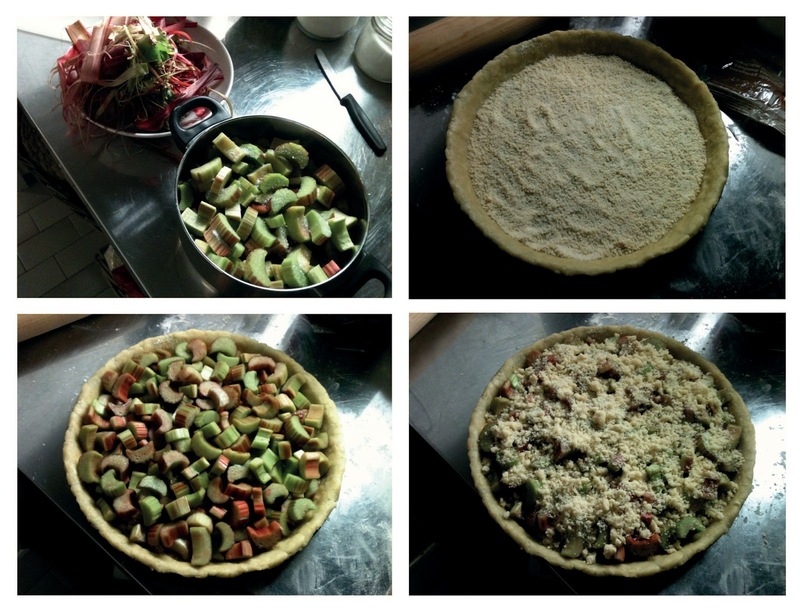 Last weekend, I went to a potluck with the triathlon team (yes I do triathlon leisurely... also to compensate for all the baking and cooking I do :-p ) and there was a rhubarb tart. It was beautiful, and so good! Nice red rhubarb pieces covered with a crispy crumble, and a shortcrust that melted in your mouth. Mmmm! I tried for a week (along with my triathlon friends) to find who had made it to get the recipe, but I was left unsuccessful. In the meanwhile, I had bought a lot of rhubarb thinking I would get the recipe. After a few days, I decided to go ahead and come up with my own recipe :-) and it turned out well! 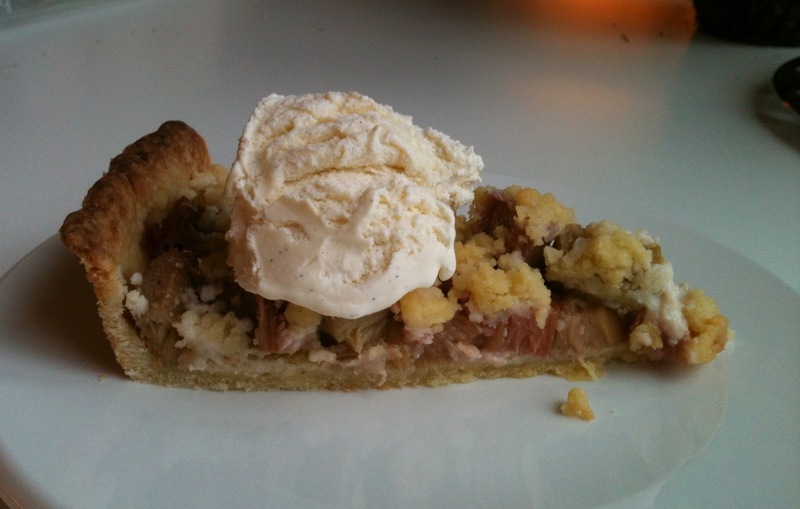 I opted for an almond shortcrust (pâte sablée in French) which I thought would soften the acid taste of the rhubarb. Many recipes I found online included a "liaison" or cream and egg mix to bind the rhubarb, but I'm not such a big fan of this so I decided to do without. Instead I decided to coat the crust with ground almonds to emphasize a bit the almond taste in the dough and to soak the rhubarb juice so it doesn't wet the crust too much. 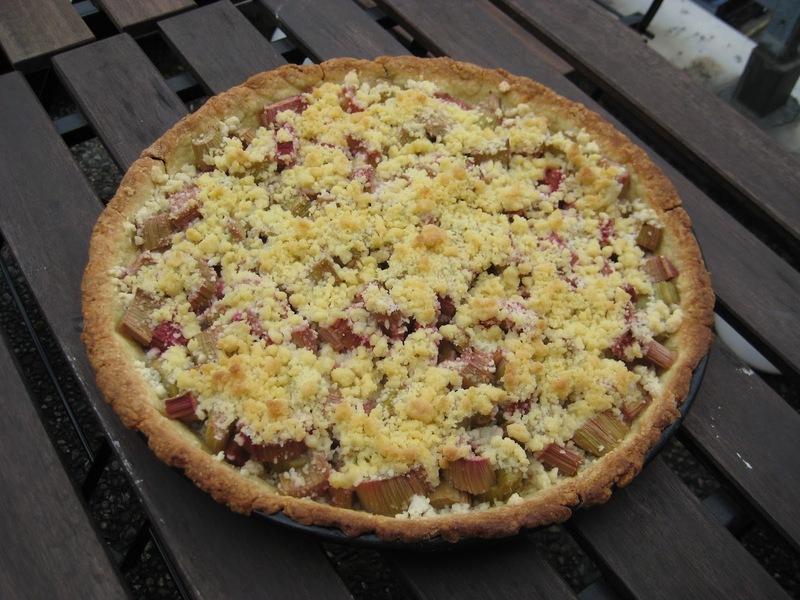 And I topped the rhubarb with a simple crumble to add some crispiness to it. I served it the next day to two of my girlfriends with some vanilla ice-cream and it was super good (according to them of course... but I think so too hehe). It made for a very nice snack on a sunny Sunday afternoon! You should try it too, and if you don't like rhubarb so much, I'm sure it works as well with apples, apricots, and plums! Enjoy!!! In a bowl mix flour, ground almonds and salt. Add the butter, mix with your hands and make small crumbs. Add sugar, the beaten egg and water, mix fast and make the dough. Refrigerate at least 30 min (under cover). Add some sugar, set aside for a while so some juice comes out. Mix all ingredients together and make small crumbs. If it's too clumpy or sticky, add some more flour. Grease and flour a big tart form. Roll out the dough, prick it with a fork. Cover the dough with ground almonds (this can help soak the juice of the rhubarb when baking). Add the rhubarb, without extra juice. Sprinkle the crumble on top of the fruits. Bake in the oven approx. 35 min at 180-200 C. Serve lukewarm with some vanilla ice-cream.